Direct measurements of the band gap of solid helium (4He) at high pressure are beyond the capabilities of typical optical techniques. This is because the band gap and associated excitations are masked by absorption by the gasket and anvils of the apparatus. Until now, there has not been an experimental technique with the energy and resolution required for such measurements. As a result of new advances in two-photon inelastic x-ray scattering (IXS) spectroscopy, however, it is now possible to make these challenging measurements under pressure. As recently reported in Physical Review Letters, a group led by CDAC Associate Director Ho-kwang Mao (Geophysical Laboratory) with scientists from HPCAT, HPSynC, NIST, University of Chicago, Brookhaven, SLAC, and Stanford has succeeded in probing the high-pressure electronic structure of helium at 300 K. Features of the electronic spectrum in the 20-40 eV range are accessible through measurements of the energy loss from high energy x-rays incident on a sample at high pressure. In addition, with IXS it is possible to measure the momentum transfer, which reveals the dispersion behavior of the excitations with pressure, giving rich information about the features the electronic structure of the solid. 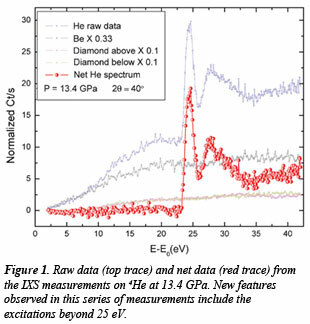 Figure 1 shows the raw data from the IXS experiment at 13.4 GPa along with data from the Be gasket and the diamond anvils. Manipulation of the background spectra made it possible to extract the spectrum of He with greater clarity than has been possible before. In addition to a the sharp exciton peak at 24.4 eV and a sharp absorption edge at 23.7 eV, additional features are now resolved at higher energy. Combined with data taken at a series of momentum transfers as well as theoretical calculations, the results show that the excitations in solid helium have a more complex character than the Wannier or Frenkel types previously assigned on the basis of less highly resolved data. 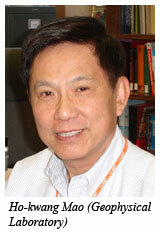 A report of this work was published in Physical Review Letters [Mao et al., Phys. Rev. Lett., 105, 186404 (2010)].